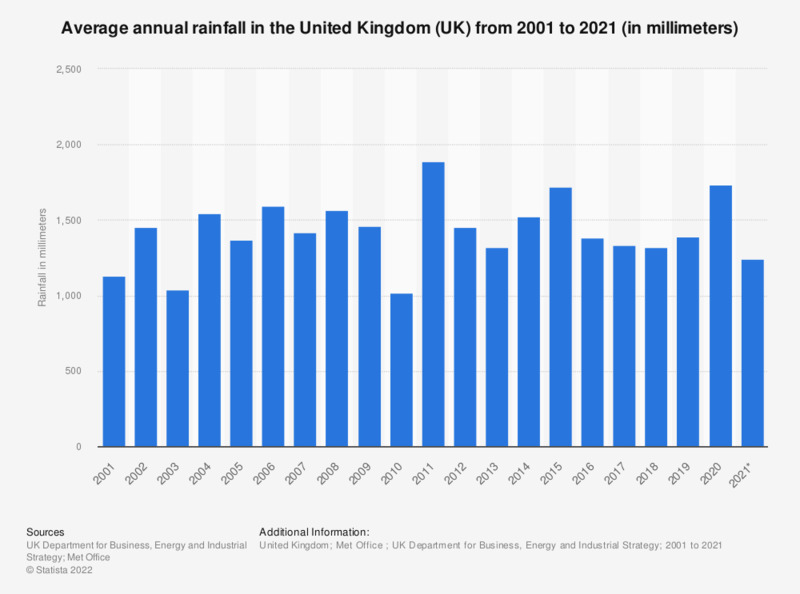 This statistic shows the annual average rainfall in the United Kingdom (UK) from 2001 to 2018. Over the period, average annual rainfall peaked in 2011 with 1,900 millimeters, compared to just over 1,000 millimeters the year before. in 2018 the average rainfall was 1,342 millimeters. Average rainfall in the UK was calculated by aggregating regional rainfall data and weighted based on each regions share of hydro-electricity generating capacity. Prior to 2016 data was published by Department of Energy and Climate Change (DECC). Following Theresa May's appointment as Prime Minister in July 2016, the department was remodeled into Department for Business, Energy and Industrial Strategy (BEIS), which has since published the data. Everything On "Weather in the United Kingdom (UK)" in One Document: Edited and Divided into Handy Chapters. Including Detailed References. How did you feel about the rain or snow in your area during winter 2013?